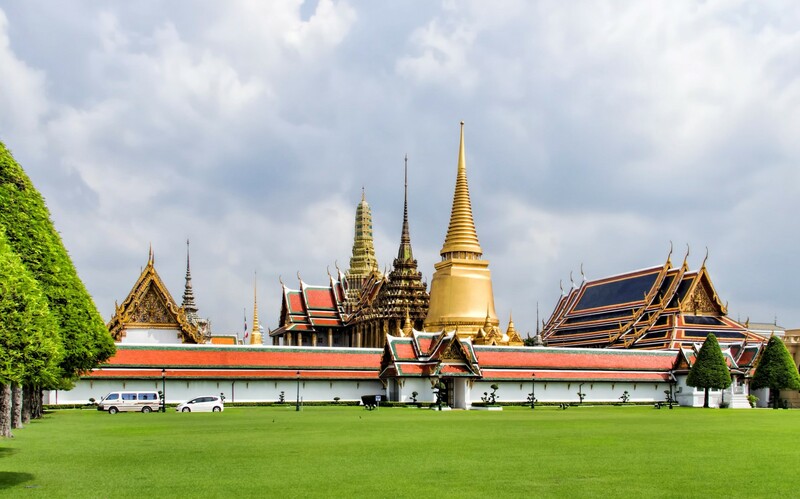 If you have limited time in Bangkok (or limited time for temple visiting in Bangkok), here’s a list of five of the best temples in Bangkok, among them the biggest, the most popular, with the best view over Bangkok, and more… But first, here’s something important. In all Buddhist temples, shorts and sleeveless tops are forbidden, dress appropriately by covering your shoulders and knees. You must take off your shoes before entering a temple, although you can wear them in the yard. Women are not allowed to touch monks or novices but can freely speak with them. Most Buddhist temples in Bangkok have a small admission fee for foreigners (usually 40 baht unless there’s a museum or an important relic inside). This huge Buddha statue (46 m/150 feet long) needs a huge complex to house it. Wat Pho is one of the main Bangkok attractions and it’s first on the list of first-rank royal temples in Thailand (only six temples are on the list). It comprises 91 small and 4 large chedis (Thai stupas), a central shrine, and many other buildings. 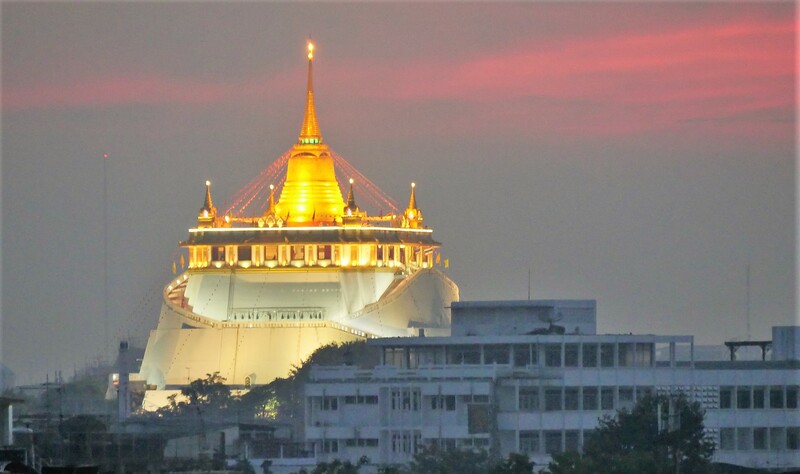 The biggest collection of images of the Buddha in Thailand, more than 1000, is kept here. 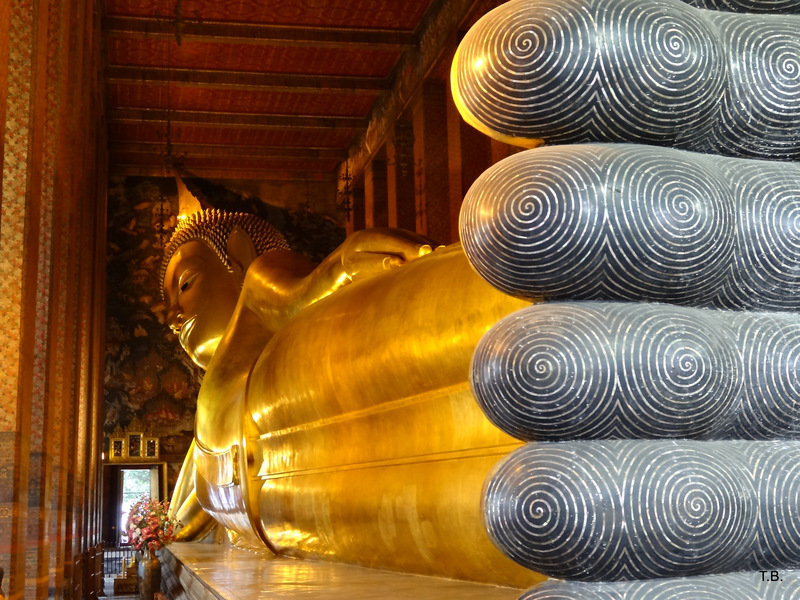 The Reclining Buddha statue itself is squeezed in one of the smaller temples. 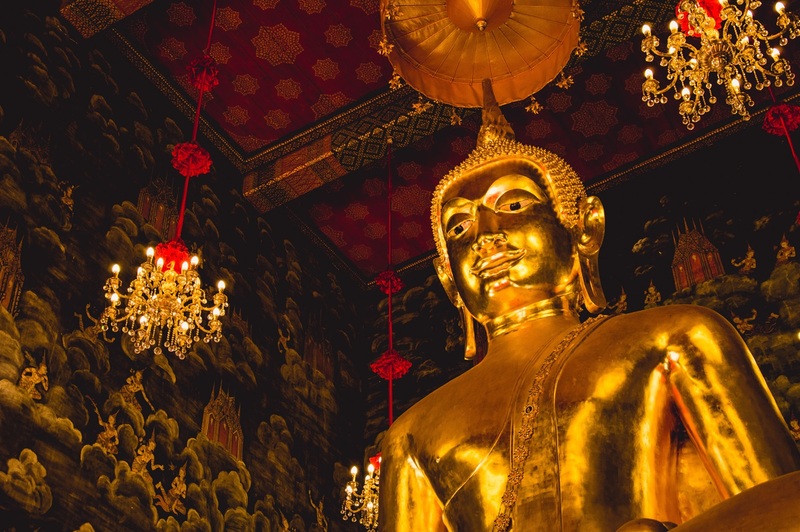 We recommend you get a guide or download some history about Wat Pho as there is so much to decipher. A Thai massage school is situated in Wat Pho, which means that if the day has been too long and tiring, you can spend a little more time in the temple area and spoil yourself with a Thai massage (30 minutes – 260 baht). It’s worth it as Wat Pho temple is considered the birthplace of Thai massage. More information here. Plan at least an hour to see the complex, 2 hours if you are into Buddhism and Buddhist architecture. The Emerald Buddha is a statue that has been around Asia for more than 2000 years and is considered the protective image of Thailand and Thai people. You might be surprised that such an important figurine is only 66 cm (2 feet) tall. It’s made of semi-precious green stone (jasper or jade rather than emerald) and wears gold clothes. Fun fact: the king of Thailand changes the clothes of the Emerald Buddha three times a year (March, August and November). Legend has it that the Emerald Buddha was crafted in 43 BC in India and moved through the centuries from Sri Lanka to Laos and Thailand. Wat Phra Kaew temple, where the statue can be seen today, is the most sacred and important temple in Thailand. Wat Phra Kaew temple entrance ticket: 500 baht (there’s no separate ticket for Wat Phra Kaew, this is a general price to enter the Grand Palace). Although Wat Arun means the Temple of Dawn, for the most amazing views you’d better see it at sunset… and from the other side of the river. Wat Arun is located on the west bank of Chao Phraya river and usually you have to take a boat to get there. Just go to the nearest river pier and take a look at the public boat transportation maps to see what boat number you need to hop on. If Wat Arun looks familiar to you even before you’ve visited it, that’s because it’s on the back of the 10-baht coin. However, the coin can’t capture the delicate tiny Chinese ceramic pieces that cover the towers of the temple named after the Hindu god Aruna. Wat Arun temple address: 34 Arun Amarin Road, Kwang Wat Arun, Khet Bangkok Yai. If you are on the other side of the river, the easiest way to get there is to get a cross-river boat from Tha Thien Pier). This glittering temple on top of an artificial hill is one of the best spots to see Bangkok from above without having to pay for expensive beer and cocktails in high-end bars in skyscrapers. Its peculiar story starts in the 18th century where the first attempt to build a temple was made by king Rama III. The marshy ground couldn’t support a heavy structure, though, and it collapsed before it was finished. Several stories like this were repeated over the years with new attempts to solidify the mound. Today it has a concrete cap on top but the base still consists of bricks. You have 300 spiraling steps to climb but it’s not a strenuous walk and part of it is under the shade of trees. The view from the top is worth it. Wat Saket, also known as Phu Khao Thong or the Golden Mount, is quite far from other attractions in Bangkok and far from convenient public transportation, so you might need to take a taxi. There’s a large temple fair every year in November. 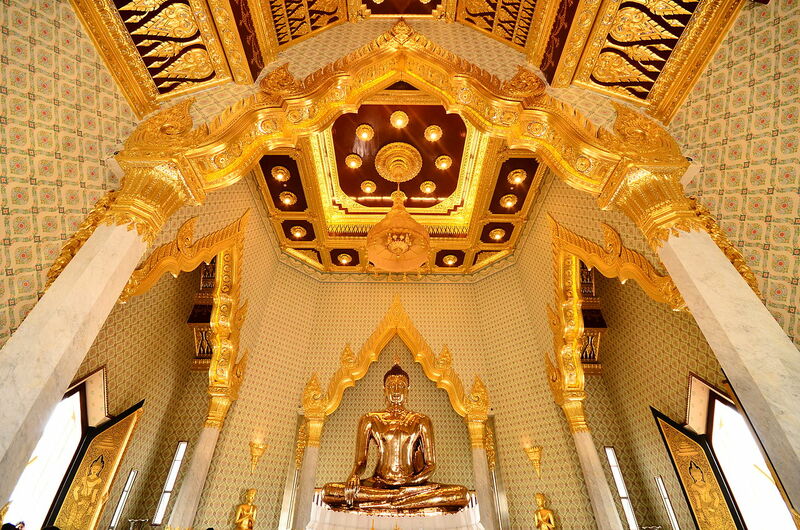 If you have always dreamed of seeing the biggest solid gold seated Buddha statue in the world, today is your lucky day. Head for Bangkok’s Chinatown to meet the 15-foot/5-meter, 5.5-ton figure and hear its amazing story. The Golden Buddha was crafted in the 13th century and, at some point later, it was covered in plaster, probably to hide it from thieves. Centuries passed and obviously, everyone forgot what was inside the cover until 1955 when the statue was moved to Wat Traimit temple. The workers accidentally dropped it and part of the plaster cracked and revealed the precious content.